As 2013 proved, content marketing is the strong engine behind today’s business marketing. Without overt promotion, content marketing provides the information prospects and customers seek in a way that they trust. Here are the seven 2014 content marketing predictions with tips on how to incorporate their impact into your business plans. The underlying message is that content marketing requires a plan with actionable strategies to achieve your business goals. 1. Content marketing diversifies in terms of type, format and size. Content creation should be part of an integrated content marketing strategy that offers small, medium and large content to meet your target audience’s needs. Create content in a variety of different formats because people take in information differently and need to see your message multiple times before it sticks. Provide useful content consumers want at every step of the purchase process. This means product information, answers to customer questions, how-to’s, styling, ratings and reviews. 2. Content marketing extends to all corporate communications. Content marketing spreads across the organization and is integrated into other communications. In 2014, it’s no longer limited to marketing. Plan your content marketing so that all of your business information is useful content written by and for humans. This includes your internal communications, manuals and other instructions, human resources documentation and investor relations material. 3. Content marketing is branded to be identifiable without a logo. Your brand becomes an integral part of your content marketing so that readers know that it’s yours without a logo. To this end, consider your 360° brand and how it shines through every piece of content. 4. Content marketing assets get managed. In 2014, with the expansion of content marketing, companies must track and maintain their content marketing assets as part of their corporate worth. This means auditing your existing content assets and determining what needs to be brought up to date, what needs to be recreated and what needs to be eliminated. 5. Content marketing resource use increases significantly. Content marketing doesn’t happen by itself. While some of your planned content marketing can be created by reassigning existing resources and budget, chances are that your plans require more people including employees, agencies (or contractors) and/or customers, as well as financial budget. Here are 14 content creation resources every marketer can leverage. Also, make sure that you have the ability to use content created by talent, employees and consumers across platforms. This means you need to support from your legal department to ensure that this is part of your contracts and releases. 6. Content marketing distribution gets more advertising support. Content marketing distribution extends beyond owned and social media platforms. While effective PR use can broaden your reach, content marketing requires paid distribution support in the form of advertising to reach your maximum potential audience. Here’s where native advertising can be cost effective. 7. Content marketing results get tracked to sales. Marketers move beyond vanity metrics to measure results that generate leads and sales. Start this effort by incorporating a tailored all-to-action to nudge readers to act. Need help? Here are 53 content marketing metrics to help you. 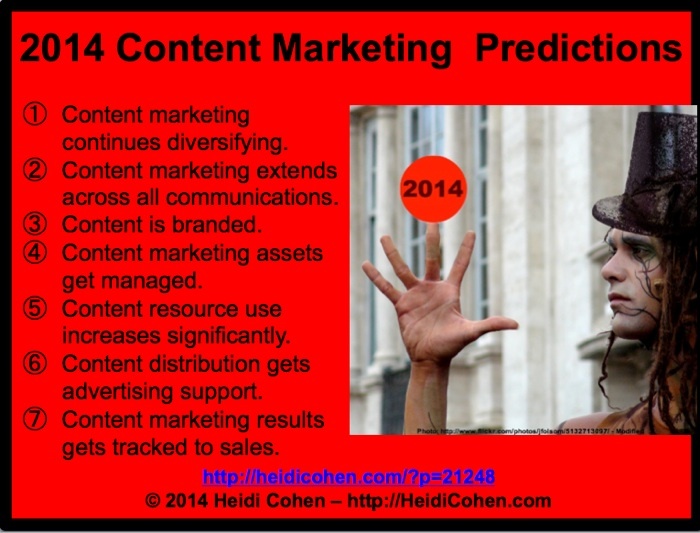 By planning around these 2014 content marketing predictions, you’ll ensure that your marketing plans achieve your business goals. 2014 will be a year where content marketing expands and becomes integrated into every facet of your business. To ensure that you achieve your business goals and utilize your resources effectively, you need to have a content marketing plan and related tactics. 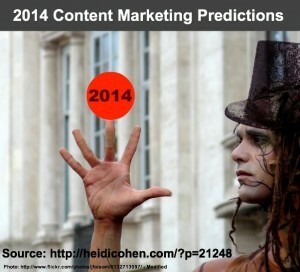 What other 2014 content marketing predictions would you add to this list and why? Tags Call-to-action, Content marketing metrics. Bookmark the permalink. Great predictions, Heidi. Totally agree with content assets needing to be managed. There are lots of organizations with loads of content created years ago that needs to be updated. My prediction for content marketing would be more emphasis on email as a medium, It’s old fashioned, but email marketing still is one of the most effective tactics in reaching your core audience. BTW, Heidi, wanted to get your feedback on a content marketing tool I’ve released at buzzsumo.com? It helps content marketers see what stories/articles have been shared the most for any niche or topic. In a sense, it shows you what people want to read, which can help in the content ideation process. Would you find it useful?